"Located at the corner of Rush Street & Oak Street, 2 E Oak is in a perfect Gold Coast location. The building contains mostly studios and 1 bedrooms. Ideal as a starter condo or as an in-town residence - located across from Barney's, next door to Prada and all the other high end shopping on Oak Street." The condos at 2 East Oak are in the heart of the Gold Coast in a 39-story highrise building. The building is located in one of the best locations in the Gold Coast. The high end shopping on Oak Street is just a stone's throw away, and the lakefront is just a block to the east. 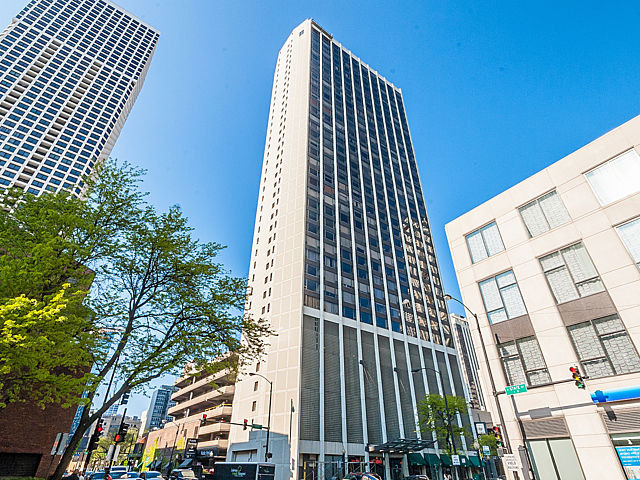 Building amenities include a modern fitness center with a pool and a rooftop deck with spectacular views of downtown Chicago in addition to 24-hour doorman service. Although 2 East Oak was originally built in 1969, many of the condos within the building have been updated with modern finishes. 2 E Oak only allows owners to have cats - dogs are not allowed. The building also has rental parking available. The building is adjacent to Gibson's steakhouse which is a Chicago and neighborhood favorite.